The Recommended Sensors function is one of the options that PRTG supports you in setting up a comprehensive monitoring. PRTG can explore any device and check which sensors you have already created. If it finds useful sensors that can complete your monitoring and are not yet created, you will find a list of recommended sensors for your specific device. By adding these sensors, you will not miss important monitoring data anymore! You want to know which sensors can complete the monitoring of your devices? 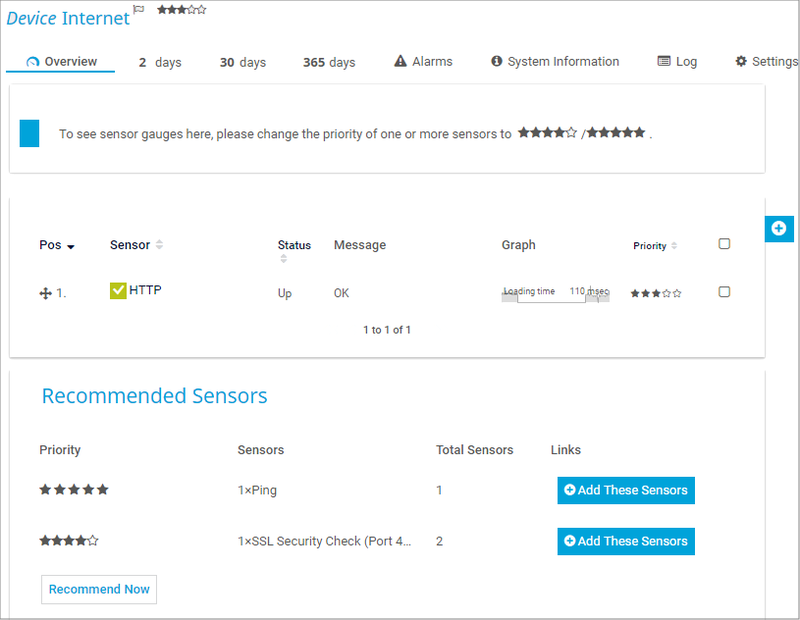 By default, PRTG recommends sensors for any device that you add to PRTG and shows the suggested sensor types for it on the Overview tab of the device, as long as your installation contains less than 5,000 sensors in total. All you have to do is click the Add These Sensors button to enhance your monitoring experience. If you want to manually start the detection engine for sensor recommendations on any desired device, follow the steps below. You can see the time passed since the last execution of the sensor recommendation in the page header bar on the Overview tab of this device. Open the Overview tab of the device that you want to analyze. To start the analysis of your device, click the Recommend Now button or select the option Recommend Now in the context menu. If you do not see the Recommend Now option, make sure that the sensor recommendation is enabled in the System Administration—Monitoring settings. Probe devices do not offer this option. Depending on the complexity of your device, it can take some time until you see the results of the analysis. Stay tuned! PRTG runs the device analysis in the background with low priority to prevent potential performance issues. Consequently, the recommended sensors analysis can take more time than expected if PRTG needs resources to ensure gapless monitoring of your network in the first place. By default, the sensor recommendation engine starts automatically when you add a new device, when you do not have more than 5,000 sensors, or when the last analysis was executed more than 30 days ago. You can change these settings in the System Administration—Monitoring. To recommend SNMP sensors for a device, the detection engine uses the SNMP version that you defined in the Credentials for SNMP Devices section of the device settings. After analyzing your device, PRTG suggests a list of sensors that are useful for a more comprehensive monitoring. Shows which priority the suggested sensors will have when you add them. The recommended sensors table is sorted by priority, beginning with top priority (5***** stars) in the first row. You can manually change the priority of a sensor after adding it. Shows the suggested sensors and the number of sensors from one type PRTG recommends for this device (for example, you might want to add a sensor from the type SNMP Traffic multiple times because of several network interfaces). Shows the total number of suggested sensors per table row. These sensors have the same priority. Displays an Add These Sensors button for every table row. Click to automatically add the sensors listed in this table row to the device. The detection engine checks if a certain sensor type currently exists on your device and recommends that you add this sensor if it does not exist. If this sensor type already existed previously on the device but you have deleted it, PRTG will suggest this sensor type again. Please ignore the suggestion of this sensor type or follow Step 4. Click the Add These Sensors button in a table row to add all sensors in this row to the analyzed device. If you want to add all suggested sensors regardless of their priority, click every Add These Sensors button in the recommended sensors table. If you want to add only some of the sensors of a certain priority and not all of them, please click Add These Sensors first and then delete or pause the ones you do not need. you want to turn off the recommended sensors function. If you use the default setting, PRTG uses an intelligent assistant that takes care of your specific network monitoring situation. PRTG automatically counts the number of sensors you have and decides whether to start the recommended sensors detection or not. It will not start if your PRTG installation comprises 5,000 sensors or more to prevent performance issues. We recommend that you set this default option so you do not miss any important monitoring data about your network, without risking running into performance issues. Disable the recommended sensors feature if you encounter performance issues or if you do not want to display this information on device Overview tabs. Do you want to get more help with choosing and creating useful sensors? This is possible in PRTG with the Auto-Discovery! You can activate it when adding a new device to PRTG, manually at any time, or choose if you want PRTG to analyze a whole section of your network, for example, devices covered by a certain IP range. The auto-discovery has a higher priority than the recommended sensors detection. If both are active, PRTG will queue the sensor recommendation and execute the auto-discovery first.